Watch the DVD preview here. Morgan Packard's debut solo full-length, Airships Fill the Sky, finds him folding cello, accordion and saxophone into a decidedly digital context - involving fragmented elements of techno, house, breakbeat oriented microsound and post-ambient tendencies - retaining his acoustic sensibilities in earnest, while taking advantage of his long-time immersion in a variety of electronic genres. While he has further honed the melodic, textural meanderings from some of his past work, here, Packard returns to his rhythmic roots, and continues to filter his jazz and classical background through everything he does. Deftly using his self-made software techniques, he puts these pieces together with a view towards the hypnotic power of the loop, coupled with a distancing from it. Remembering its importance as the structural basis of a musical landscape which has influenced him, he allows his loops to take on new properties, evolving incrementally and moving further from their origins. From the opening, title track's accordion lines into house bumps, to "Mink Hills" - with its symphonic clusters sitting harmoniously in layers of horizontal sound and clattering percussion pops - to the unabashedly funk-filled synth movements of "Waterbugs" - Packard manages to span a variety of musical choices and retain a coherence throughout. With a heavy emphasis on sound design - both in the close-ups of sonic minutiae and the wider swathes which cut across tracks - he exhibits technical savvy coupled with compositional inventiveness. The accompanying Unsimulatable DVD provides a snapshot into the collaboration between Packard and Joshue Ott. Ott uses his homemade software, entitled superDraw, to wield a flexible, visual instrument. 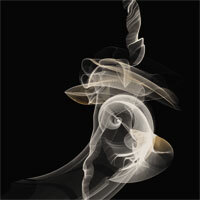 Using a digital drawing tablet and pen to input simple sketches of lines into the computer, Ott effects and bends these lines to create something far removed from the original input, nestling into a comfortable space of abstraction that is oddly familiar in its curiosity and fresh in its mannerisms. superDraw examines and interprets the constant motion - both of the hand/stylus as it moves around the tablet, and of the line after it exists inside the software. This analysis allows the creation of movement that is inspired by the results of the original input, lending itself to a cycle of input/output that is consistently influencing and referencing itself, so that the blurring of the lines - both literally and figuratively - is part and parcel of the experience. What begins as a simple line becomes multiples of new shapes and angles, with often muted - and sometimes stark - washes of color running over and through contrasted black and white. The collaboration between Ott and Packard (which includes almost exclusively different music from the CD) is the culmination of two years of playing live shows together and consistently honing their interaction and the means by which their computers communicate with each other. Though individual scenes can be devised beforehand, neither program allows deferred creation, so no editing is possible, and the entire piece had to be recorded live in one take. Bonus material on the DVD includes audio-visual sculptures, a music video and details about the project and the artists.